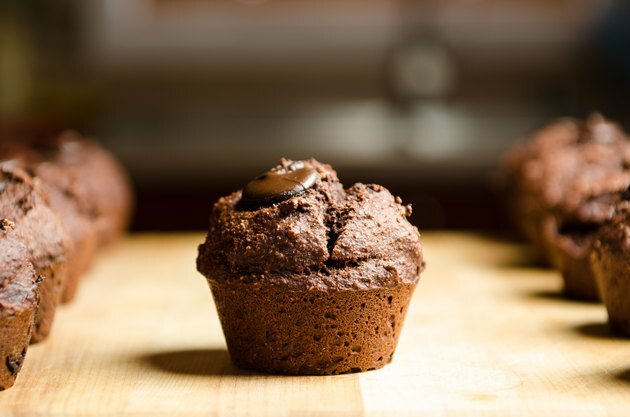 Muffins are an excellent way to increase the amount of whole grains in your family's diet. When you add some nuts and fruit, you increase the nutritional benefits as well. Muffins are portable and can provide a quick on-the-road breakfast source or be part of a paper bag lunch. The key to the texture and moisture content actually comes in the baking process. However, with proper storage, moist muffins will stay that way for several days. Cool the muffins fully if homemade. Leave them in the paper liners. Transfer your muffins to a resealable plastic bag. Close the top of the bag and place it in a cupboard or bread box. Place the muffins into an airtight storage container as an alternative to a bag. Put the lid onto the pan after situating the muffins and then store them in a cupboard or bread box. You can freeze muffins for long-term storage. Wrap them in aluminum foil prior to putting them in the freezer. They will keep for up to three months. Leave the muffins at room temperature as opposed to putting them in the refrigerator. Muffins will stay fresh for up to three days.